Greetings to you from LV-426! If you were to sit down and talk with me about my favorite films, Ridley Scott’s original Alien would make my top five. Heck, it might even be my number one. This list is constantly in flux for me, but that one stays in my top 5 consistently. There are lots of things about this film that keep it in or near the top for me. Here are a few. I am continually amazed by how much horror is conveyed while the Xenomorph stays in shadow and is never fully revealed until the end. Ripley is a heroine that is not only strong and powerful with a will to live like no other, she is also compassionate towards her crew. She’s such an interesting character and was quite different from the way most females were portrayed at the time. (I could write you a whole other post about the influence of Star Wars and Princess Leia on this film and Ripley, but I’ll save that for another day). Alien is rooted firmly in the science fiction and horror genres, bringing forth the best elements of both. The cinematography is gorgeous. 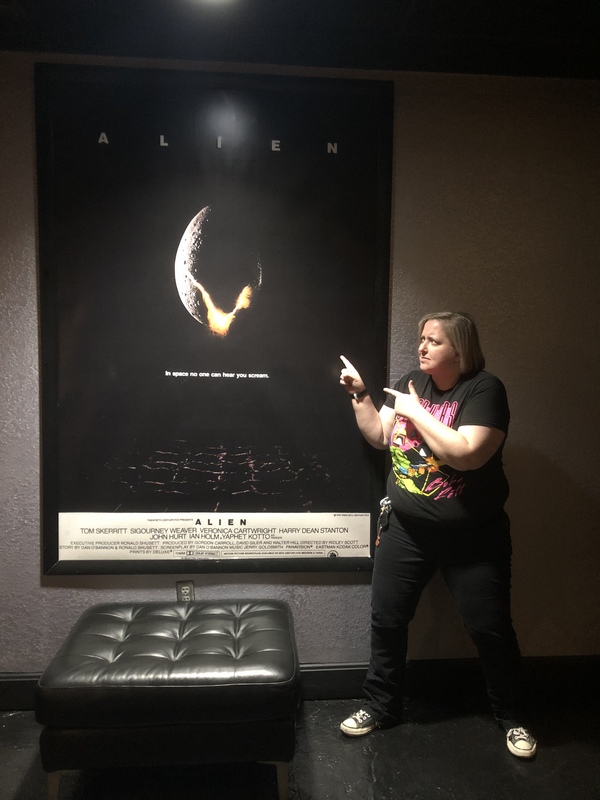 I was fortunate enough to see both Alien and Aliens on the big screen in 2016. If you ever get the opportunity to see it on the big screen, do it. It’s totally worth any effort you make to do so. The film has influenced other films and television shows I love, notably Stranger Things. I could go on and on about all the things I love about Alien and the other films of the franchise, but I’ll be saving that for another day. Which day you ask? How about next Thursday, May 3 from 8:30 – 10:30 PM ET with Kat Sas & Curtis Weyant from Kat & Curt’s TV Re-View and Dominic Nardi of NardiViews? I’ll be joining these fine folks for a discussion on Alien for the next Mythgard Movie Club. Register here to get a reminder e-mail and link about the discussion. Looking forward to seeing you all there! This entry was posted in Interviews, Movie, Speaking Engagements and tagged Alien, Alien Day, Film, Horror, horror movies, Kat & Curt's TV Re-View, LV-426, Mythgard, Mythgard Movie Club, NardiViews, Ridley Scott, Science Fiction, science fiction movies, Signum University. Bookmark the permalink. 1 Response to Happy Alien Day! I’ve only seen the latest one in the theater, but I agree that the first one is stellar. Good luck with your panel. You’re gonna rock it!